Today I decided I wanted to blog about something magical! Though we don't have any well-known magicians in Bolivia, we have witch doctors! 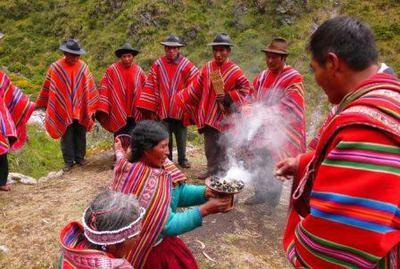 In the Andes of Bolivia the kallawayas are healers from the Mollo culture. They live in the Mountains called Bautista Saavedra which is North of La Paz. Think of them as doctors for the tribal people in Bolivia. They create medical techniques using ANCESTRAL POWER! These people travel around and have used about 980 species of plants in their medicines! The Kallawaya medicines rate as some of the richest and most effective in the WORLD! The Kallawaya use the parts of plants, animals, and minerals for different medicines and use over 300 herbs too. Before they heal the sick they have ceremonial dances, known as the yatiri, which means Healer. Sometimes they travel massive distances ON FOOT to places even outside of the country like Peru, Chile, Argentina and as far as Panama which is outside of South America and in Central America. The Kallawaya have been around for many, many, MANY, MANY! Years, even a skeleton of a Kallaway was uncovered that dated back all the way to 800 and 1000 BC, which is two thousand years before the rise of the Incan Empire. They are often called the sacred healers of the Andes but are more known by the term Witch Doctor. When fathers tell their sons their Kallawaya secrets, they tell them in a secret language that the sons have to remember and no one else knows! (Sounds Fancy!) Image Source. Today I've written almost 50 blog posts. Keep following my blog. There will be a special secret 50th Blog special coming up! Bye!